Wearables is still a relatively new and exciting product category with many commentators agreeing that wearables again stole the show at CES 2017 in January. The range of products available is vast and several newer brands have emerged to challenge the traditional consumer electronics giants. Harris Interactive decided to undertake a review of the different brands in this category using its hi brands approach. We find that in most consumer electronics categories, Apple manages to couple high brand equity with strong future relevance and vitality. Wearables is no exception, and despite the problems that Apple has experienced with the Apple Watch over the last couple of years, it is still the top brand in the category – for now at least. Other established brands in consumer electronics and sports categories – Samsung, Microsoft and Nike – also have high current equity but these brands are viewed as less future relevant in wearables. Fitbit – strongly associated with wearables through its ubiquitous fitness monitoring devices and apps – is viewed as being the most future relevant brand. This is despite recent profit warnings that suggest the company has over-reached. 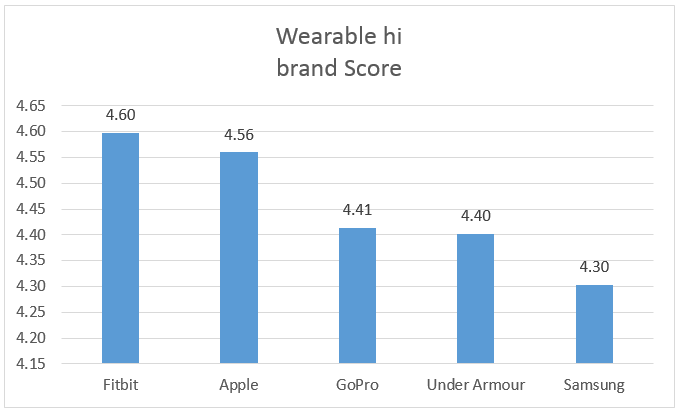 Other brands that are strongly associated specifically with wearables – Under Armour and GoPro – also have high future relevance and vitality but are less well known right now. These could challenge more in future if they can increase consumer awareness. Overall, this is shaping up to be an interesting and competitive sector with lots still to play for. Register for our webinar on 17th May at 11:00 to learn more valuable information about hi brands.